Here's a nice Bulova Rhapsody in its original box. We have another example from the same year, but we couldn't ID the variant. 23 jewel 5AH, which is not based on an ebauche, case is White Rolled Gold Plate. A very nice complete set! 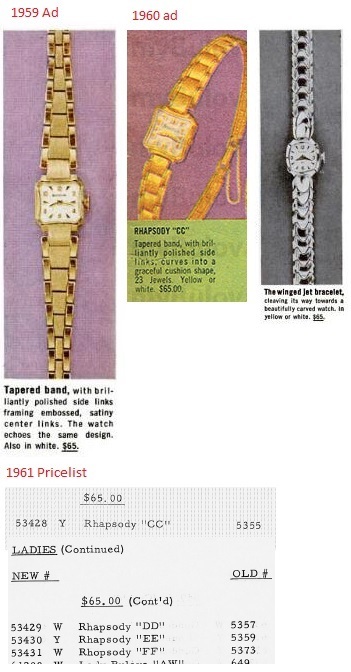 1959 Bulova Rhapsody as shown here (yellow gold version). Sweet & complete! Can't say I have ever seen an example of that box before. I haven't seen one like this before, either. The box is curiously heavy, made of folded steel and covered in heavy duty faux leather. Still my favourite ladie's model.I must have a dozen of these in different variations.I can't seem to stop buying them and I'm always on the lookout for the ones I don't have. I have one posted here with the whole package;inner and outer box with the original literature. I just checked the database and I was certain I had more Rhapsody models listed.I found them and they are listed under Rapsody.I must have made a spelling mistake and nobody caught it.It would be nice if someone corrected this.Sorry and thanks in advance admin.